A couple of days ago I was at my local Whole Foods and came across feijoas (fā-yō-a, -hō-a), rhyming with balboa. However there are other pronunciations like fē-jō-a. 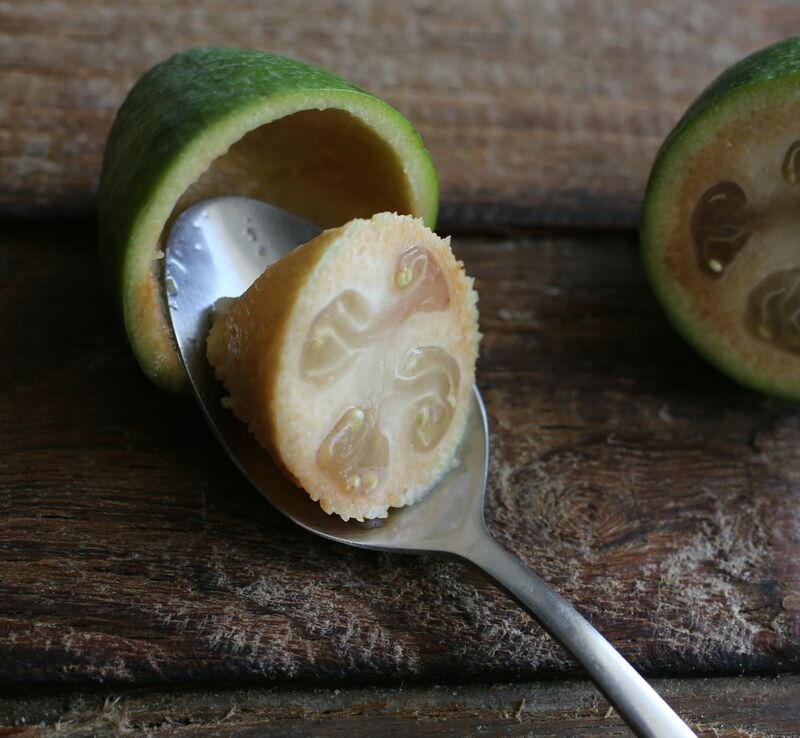 Native to the highlands of Southern Brazil and other areas in South America, feijoas are widely cultivated as a garden plant and fruiting tree in New Zealand where the season runs from March to June. 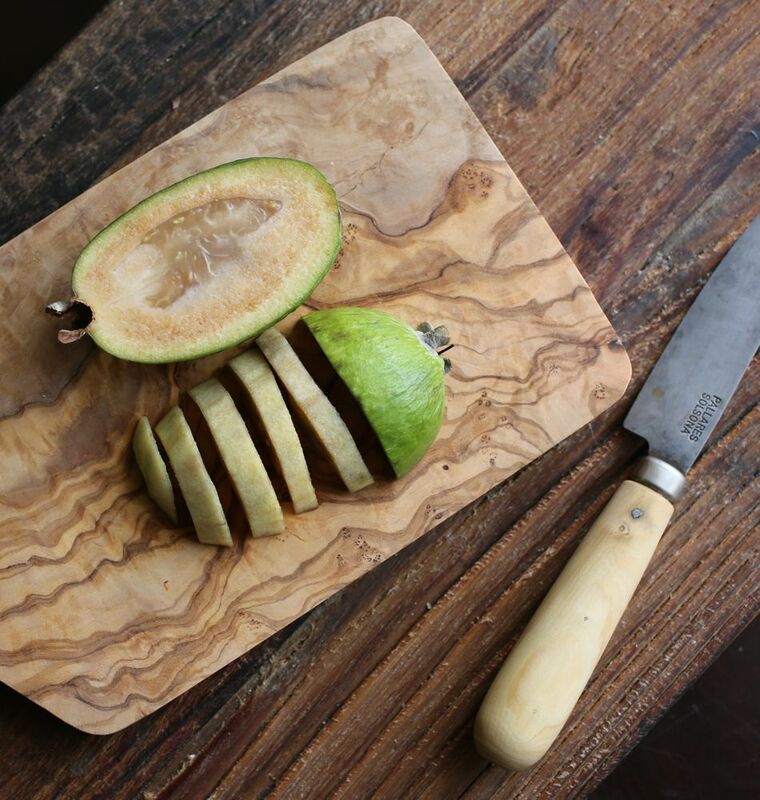 Although they’re grown in parts of Northern California, feijoas are a rare sight in the U.S. I had never heard of feijoas so I had to give them a try. Unique and sweet, they have an aromatic flavor that tastes like a cross between a guava, pineapple and a strawberry. 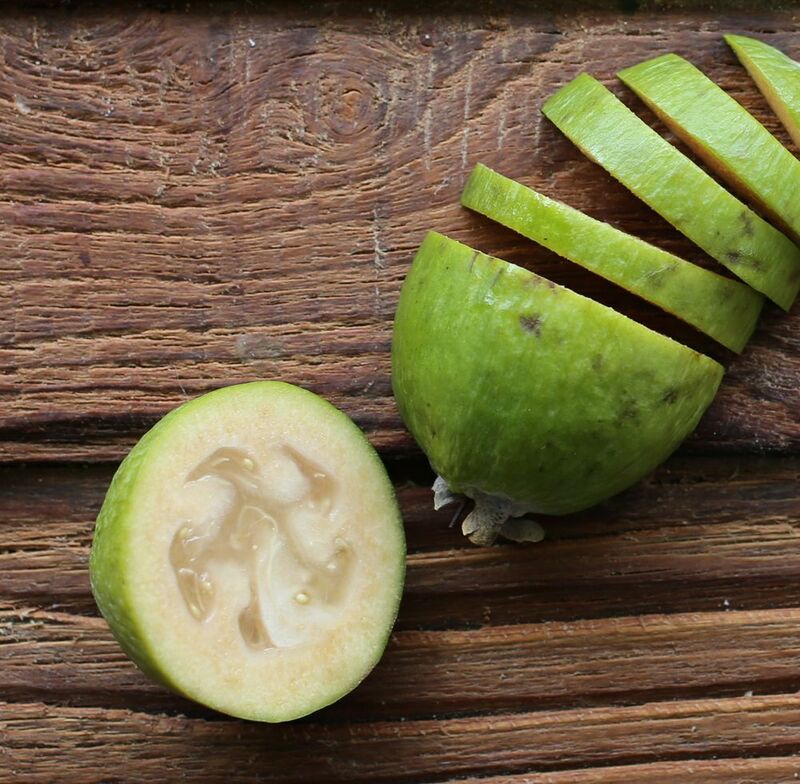 Some people call them pineapple guava or guavasteen. They’re slightly tart, but also sweet and juicy. The pulp looks similar to a guava, but the seeds are not as hard. Inside, the flesh is opaque and divided into a clear, gelatinous seed pulp that swells as the fruit ripens. There are a few ways you can eat feijoas, but the most common way is to simply slice them in half and scoop out the pulp with a spoon—similar to eating a kiwi fruit. They can also be used to make smoothies, cakes, jam, ice cream, yogurt, cider, chutney and a variety of creative dishes. Shortly after I retuned home with my feijoas, I noticed Susan of The Kiwi Cook had posted a recipe for Feijoa, Apple, and Boysenberry Crumble. Sounds delicious. I’m sure feijoa’s complex flavor makes a wonderful addition many recipes. Have you tried feijoas? If so, how do you eat them? Any recipes? Thanks for linking to Kiwicook! 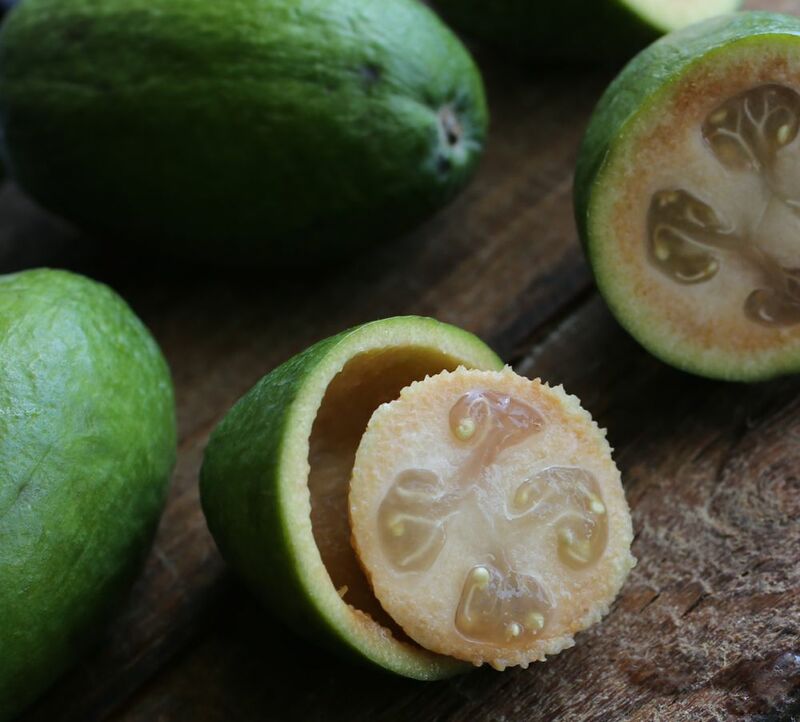 Feijoas are a national fruit here in New Zealand – many back yards feature a feijoa tree. You’re very welcome! I’ve really enjoyed learning about feijoas and eating them! Never heard of them, but they sound lovely. And your photographs are stunning. Hi Seana, thank you. I’m happy to hear you like the photography. Feijoas are quite interesting and unique. I hope you’re able to try them sometime. Feijoas are my favourite. No need to do anything with them, just wait for them to ripen, cut them in half and scoop out the deliciousness! Thank you Sophie! I’ve been scooping with mine too. Yum! So easy and tasty to eat as is. Today, though, I’m tempted to try them in my morning green smoothie! Thanks for commenting on your experience with feijoas!